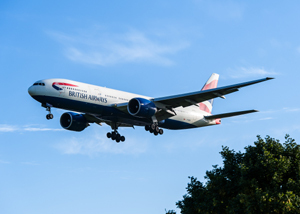 On January 17, 2008, a British Airways 777-236ER equipped with Rolls Royce RB211 Trent 800 engines, landed short of runway 27L at Heathrow International Airport. The airplane was operating as Flight 38 from Beijing to London with 136 passengers and 16 crew members on board. The airplane impacted the ground short of the runway, skidded in the grassy area and came to rest at the end of the runway. This resulted in substantial structural damage but there was no fire. The airplane was successfully evacuated with one passenger receiving serious injuries, and all others only minor injuries. Analysis of the Flight Data Recorder and the Quick Access Recorder data showed that there were no anomalies until final approach. As the airplane approached the runway, recorded data showed a thrust increase commanded by the autothrottles. The engines initially responded, but at an altitude of 720 feet, right engine thrust dropped below the commanded thrust. Approximately 7 seconds later left engine thrust also dropped below the commanded thrust. Both engines continued to produce thrust, at an engine speed above flight idle, but less than the commanded thrust, and lower than the thrust necessary to reach the runway. The British Air Accidents Investigation Board (AAIB) determined that the most likely cause of the accident was a fuel flow restriction on both engines, resulting in a significant thrust loss during final approach. The fuel flow restriction was concluded to have been the result of an accumulation of ice in the fuel system which released in a short time period, collected on, and restricted fuel flow through the Fuel-Oil Heat Exchanger. The associated thrust loss resulted in a reduction in airplane performance, and a deterioration in the flight path such that landing on the runway was not possible.